Now that the 25th is history, I’d like to add a few comments. In the first place, in an earlier letter to our members, I said that I was extremely proud, grateful, and honored to be in this position for numerous reasons, not the least of which was to help celebrate such an important milestone. I say “help,” because without the support and assistance of a totally competent and dedicated group of LBC lovers, this would not have been such a success. For this to happen, I must thank all those who traveled from near and far, as Tom and Richard noted, undeterred by rain, hail, sleet, snow and whatever obstacle thrown at them (okay, so I am prone to some minor exaggeration) to make the show what it is: an opportunity to display our pride and joy in the British auto, compete for some gorgeous trophies (thanks to Marc Cherry), enjoy the Florida sunshine, and both build and renew wonderful friendships. The winners listed are evidence of a fantastic array of all makes/models/years of the finest examples (and maybe some not so fine) of British engineering and style. Kudos go also to PBCA members, without whose tireless work this would not have happened. I have to start with Tom Schmitz, whose chairmanship has been crucial to the success of this event. Deserving sincere thanks is Marc Cherry, who fabricated the outstanding trophies and coordinated all manner of details required to overcome the obstacles associated with parking, registration, entry, photos, raffles, refreshments, the “Not Quite Fab” Band, and any other item or headache associated with the move to a totally new venue. His parking crew, the raffle crew, emcees, registration/entry/refreshment personnel, all too numerous to mention by name, are and have been the backbone of the Brits on the Bay success for years. A hearty and sincere thank you goes to all. June 6 — First Tuesday Breakfast, the Grand, 10 a.m.
June 14 — Executive Board meeting/lunch, the Grand, 12 noon. June 17 — Fred Veenschoten Garage Tour, 9 a.m.
June 19 — Dinner/general meeting, Sonny’s, 6 p.m.
July 17 — Dinner/general meeting, Horizon Buffet, Gulf Breeze, 6 p.m.
July 23 — Annual Pig Roast, Schmitz’s home, Lillian, Ala. The “Brits on the Bay” 25th Anniversary Show was a smashing success. 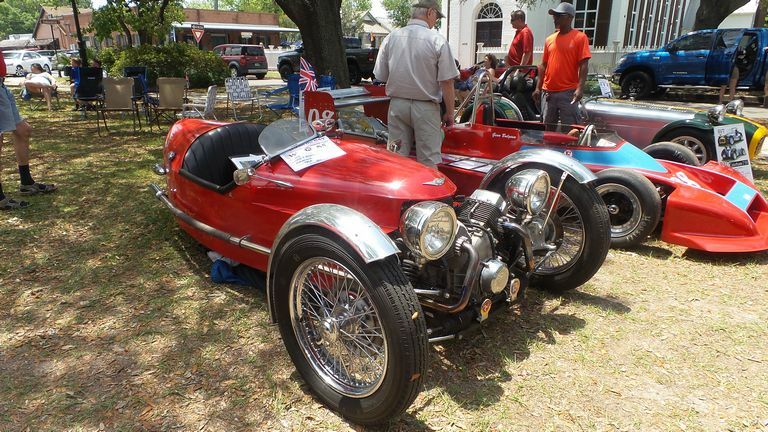 Because it was such a memorable event, celebrating the quarter-century of our annual British Car Show in Pensacola, we set out to make it a grand and glorious event and we did. With 143 cars and drivers coming from much of Florida and Alabama, as well as Louisiana, Mississippi, Georgia, Kentucky, Tennessee, Indiana and as far away as Wisconsin, they knew we would not disappoint them, and we didn’t. The weekend began at our iconic Friday Night Welcome Party, with more than 160 attendees, a display of past show winners’ cars, special gifts, and overflowing tables of food and drink and desserts. We were entertained by our local Bagpiper band and a great welcoming in the beautiful Museum of Commerce. We segued into the Saturday Show, with great Goody Bags, which were zippered document bags stuffed with multiple items. There were doughnuts and coffee for early arrivals. The favored “Not Quite Fab” Beatles cover band played in the afternoon. There was a spectacular raffle and a 50/50 that lined someone’s pocket generously. We were located at our new venue, Historic Seville Square, a park near the center of downtown Pensacola, on the grass shaded by century old live oaks.